Umberto Robina is a character in the 3D Universe who appears as a supporting character in Grand Theft Auto: Vice City (set in 1986) and Grand Theft Auto: Vice City Stories (set in 1984). He is the leader of the Cubans gang, also known as Los Cabrones, in Little Havana, Vice City. He is the son of café owner Alberto Robina. He is voiced by Danny Trejo in both appearances. Umberto Robina was born to café owner Alberto and an un-named mother. He became a member and later the leader of the Cubans gang in Little Havana, where he also purchases a House. He leads the gang into the drugs trade and establishes links with arms dealer Phil Cassidy and Trailer Park Mafia leader Marty Jay Williams. Following the death of Williams, Robina hires his killer Victor Vance and initially has him prove himself by collecting a package while in competition with other Cubans. Vance, after successfully delivering the package to Robina in Viceport, is employed again to stop a number of Cholos gangsters creating havoc in Little Havana. Robina later hires Vance to drive his father Alberto from the Hyman Memorial Stadium back to his café as the Cholos look to get revenge after their gangsters were killed. A greatful Robina brings Vance back to his house for one last job, to destroy a warehouse owned by the Cholos, which Vance and the Cubans accomplish. The Cholos, severly weakened by the destruction of their warehouse, are quickly forced out of the city. Robina continues to lead the gang as Vance inadvertantly becomes involved with the Mendez Cartel, who later cut their ties and attempt to take control of the businesses owned by the Vance Crime Family. Lance Vance, Victor's brother, brings Phil Cassidy and Robina to help protect some of their businesses, which they manage to do. Robina continues to lead the Cubans gang through 1985 and 1986 and, at some point, gains a new enemy in the form of Auntie Poulet and her Haitians gang. Robina, in an attempt to combat the Haitians and his other problems, begins to employ chef and hitman Leo Teal and continues to be involved with the drugs trade, establishing links with drug baron Ricardo Diaz. Diaz later has his men shoot up a deal between the Forelli Family and Vance Crime Family. Forelli mobster Tommy Vercetti, looking for those responsible, later kills Teal and takes his cell phone. Robina later calls Vercetti, thinking he is Teal, and after learning of Teal's death tells Vercetti to visit him at his fathers café. Vercetti later visits the café and Robina tells him to meet Rico and prove himself in a boat challenge. Vercetti proves himself and later raids the Haitians processing plant, stealing a van full of an unknown substance. Robina, knowing the Haitians are involved in the drugs trade with the Sharks, dispatches Vercetti to shoot up a deal and steal the drugs and money, which he again manages despite being followed by the police and FBI agents. During this time Vercetti also begins working for Poulet, while under the influence of mind-altering drugs, although Vercetti does not remember his actions, which include destroying two Cuban boats and killing Cubans gangsters in a fight against the Haitians. Robina, unaware of Vercetti's actions, later employs him one final time to destroy the Haitian processing plant. 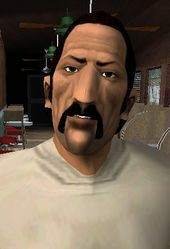 In GTA Vice City, Umberto Robina often tells Tommy Vercetti that he has "big cojones", although in GTA Vice City Stories, he often tells Vic Vance that he has "big balls". Umberto Robina has a similar personality to Brucie Kibbutz from Grand Theft Auto IV: both characters are known for liking women and often praise the protagnist for their skills and male personality. Long term feud with Haitian criminals. Wants control of turf. Wants to wage full scale war with Haitians. Never implicated in a crime personally. Bravery has been questioned within Cuban circles. Umberto Robina in GTA Vice City Stories. Umberto Robina meeting Victor Vance in Nice Package. Umberto Robina meeting Tommy Vercetti in Stunt Boat Challenge. Umberto Robina artwork from GTA Vice City Stories. Artwork from GTA Vice City Stories. This page was last modified on 5 April 2013, at 20:20.